ISLAMABAD, Jan 23 (APP): President Mamnoon Hussain on Monday urged the world to get united against violence and extremism. 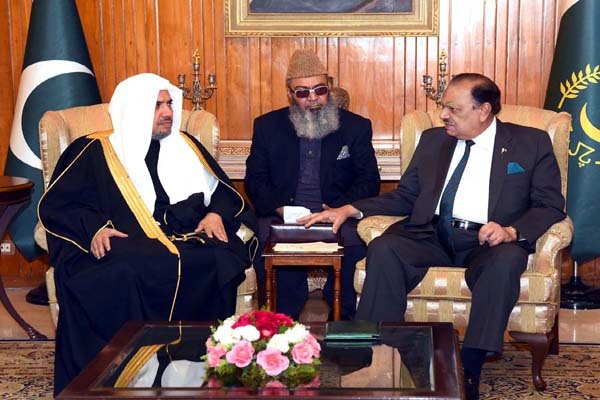 Talking to Secretary General of Muslim World League Dr Muhammad bin Abdul Karim Al Essa here at the Presidency, the President said Pakistan was greatly affected by terrorism and overcome the menace to a large extent due to government’s prudent policies. The President said terrorism was not only the issue confronting Pakistan but also a global problem, for which the Organization of Islamic Cooperation (OIC) needed to devise an effective policy. He said a system should be in-place for revival of infrastructure of the countries affected by terrorism, which had created a negative impression about Muslims all over the world. He called for tackling the issue of terrorism on war-footings. The President told the Secretary General that being the head of an Islamic organization, a great responsibility lied on him to work for creating a policy aimed at harmony among Muslims. He mentioned that taking different justifications, many places of the Muslim world were targeted and added that the Muslims of Palestine and Kashmir were facing big challenges. President Mamnoon said Pakistan forcefully fought the menace of terrorism and extremism at its soil. Secretary General Dr Muhammad bin Abdul Karim Al Essa lauded the steps taken by Pakistan against terrorism and said the world community particularly Muslim countries should benefit from the expertise of Pakistan. Minister for Religious Affairs Sardar Muhammad Yusuf and Senator Allama Sajid Mir were also present on the occasion.